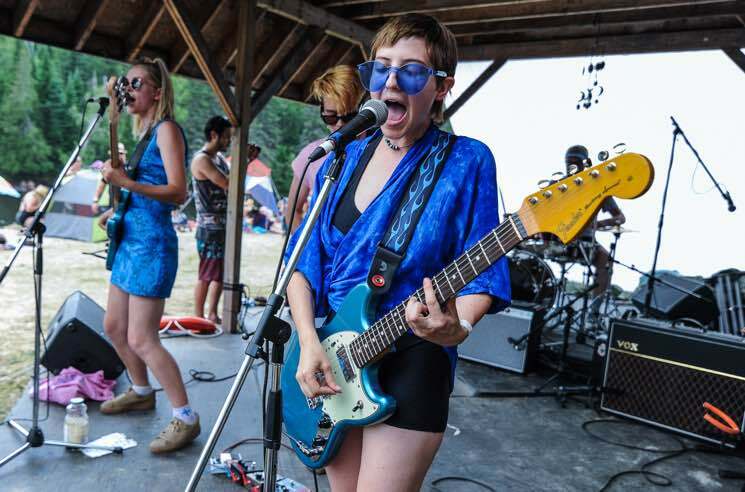 Toronto quartet PONY craft the type of punchy power-pop that could perfectly soundtrack a beach party, so it was fitting that they played River and Sky in a gazebo — surrounded by an actual beach party. The setup meant attendees didn't have to crowd around the stage to enjoy the tunes, with many opting to just enjoy the party atmosphere (and the water). But for those who did gather stageside, they were rewarded with a great set. The band's hectic performance schedule over the past few months has really tightened up their sound, and they doled out tracks packed with plenty of hooks and grooves throughout the set. New singles "DIY" and "Alone Tonight" (the band's first releases since signing to Toronto label Buzz Records in February) marked a strong launchpoint for the rest of their new material, which kept the summery vibes in tact, while also adding some gritty howls and post-punk noise to the mix. The chemistry between frontwoman Sam Bielanski and bassist Eva Link extended beyond their matching aqua blue guitars; the combo of Bielanski's sweetly energetic vocals and Link's '60s-esque harmonies drove many of the tracks. Other guitarist Stephen Giroux delivered some serious riffage as he bounced around mid-stage, while drummer Matt Sandrin anchored it all with sharp fills. Every part is vital in PONY, and all were fun to watch. By the middle of the set, many of the swimmers agreed as they sought out the shore to better enjoy the performance. As we all learned, listening to PONY is as refreshing as a dip in the lake.